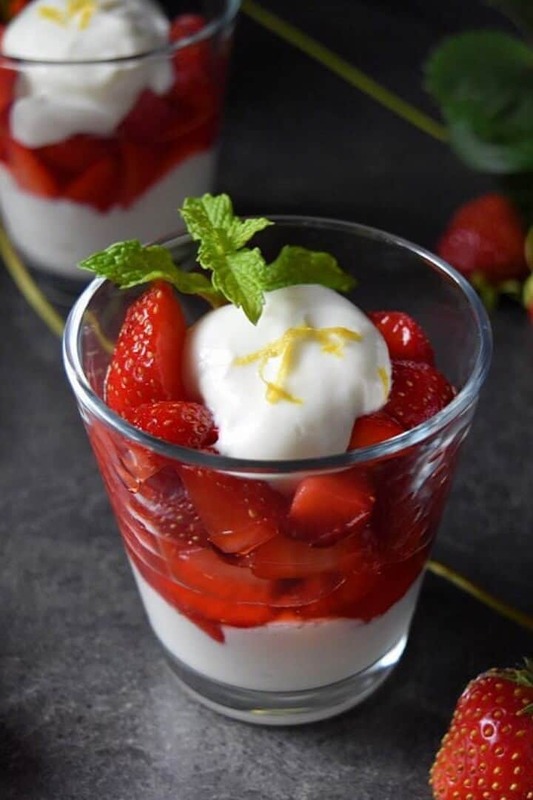 Made with simple ingredients, this crowd pleasing strawberry Whipped Ricotta Parfait is the perfect no bake dessert for your dinner parties. Ricotta, yogurt & honey are whipped together to create creamy, luscious layers that are visually stunning when combined with macerated strawberries. Such a refreshing dessert! It’s finally strawberry season! Is there anything better than biting into a freshly picked, farm fresh strawberry? The fragrance and flavors are truly irresistible. I don’t know about you, but I just can’t help myself. Confession time… I get a little carried away whenever I go strawberry picking. I anxiously return home with baskets and baskets of strawberries to start my yearly ritual of making a few batches of this recipe for Homemade Strawberry Jam. These little jars make perfect hostess gifts. When it comes to strawberries, this recipe for Simple Macerated Strawberries is another one of my favorites. I have already shared with you how delicious it is when served with this Traditional Italian Citrus Ring Cake. Strawberries, along with other small fruits like blueberries and raspberries also make a great dessert when they are baked together in free form pie such as this Summer Crostata Recipe. 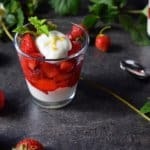 There truly are so many wonderful desserts you can make with strawberries! Today, I am layering the macerated strawberries with whipped ricotta. The creamy texture of the ricotta is achieved without the addition of cream cheese nor whipped cream. Let me show you how easy this recipe comes together. As you can well imagine, one of the key ingredients in this recipe is the ricotta cheese. Combine it with a few tablespoons of honey and yogurt; and process the mixture until smooth and creamy. 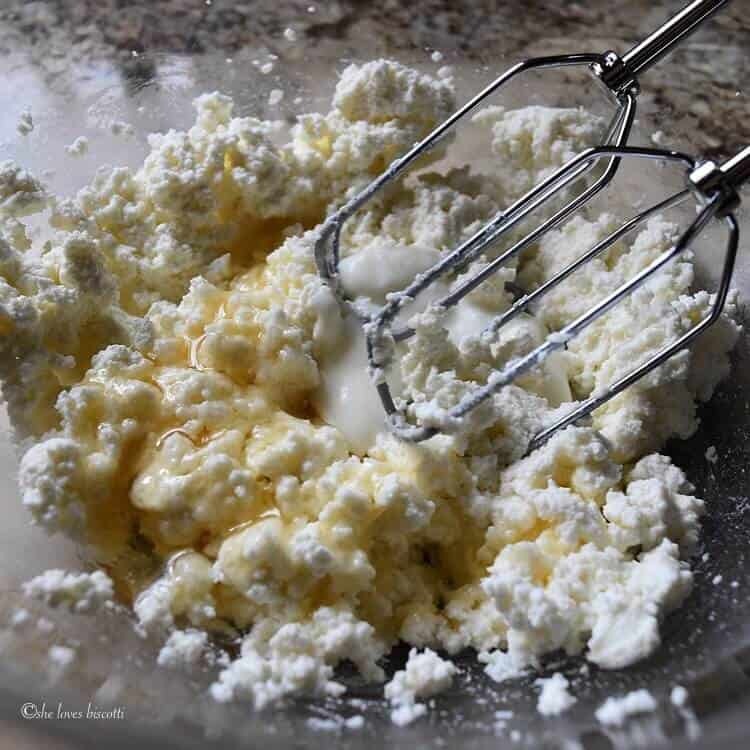 There are different ways you can whip ricotta cheese in order to achieve a creamy, aerated texture. You can use a handheld mixer, a handheld immersion blender or even a food processor. Using a handheld immersion blender is ideal for small batches; a food processor is great for larger quantities (recipe can easily be doubled). Once you obtain a smooth and creamy texture, transfer to a bowl, cover and refrigerate for at least 1 hour. 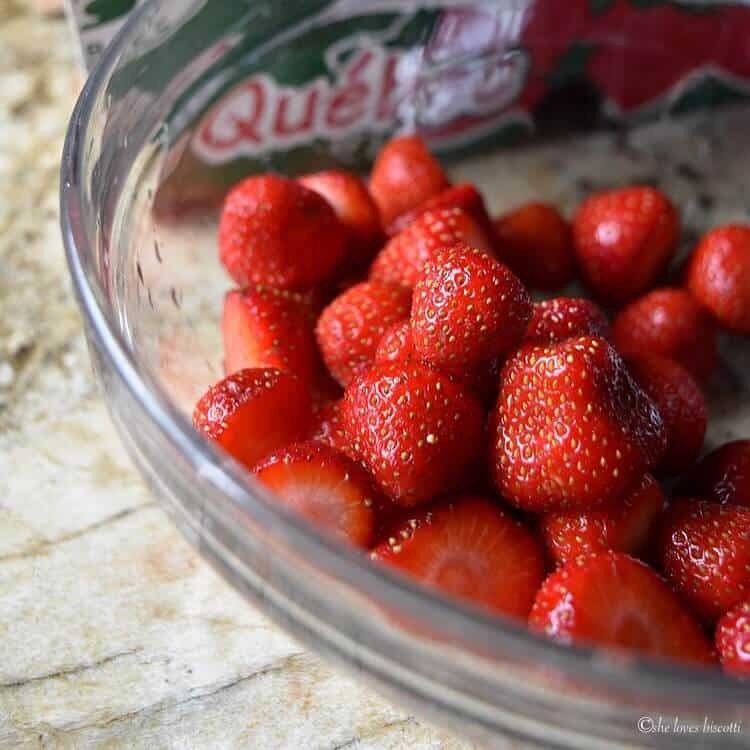 While waiting, you can make the recipe for Simple Macerated Strawberries. 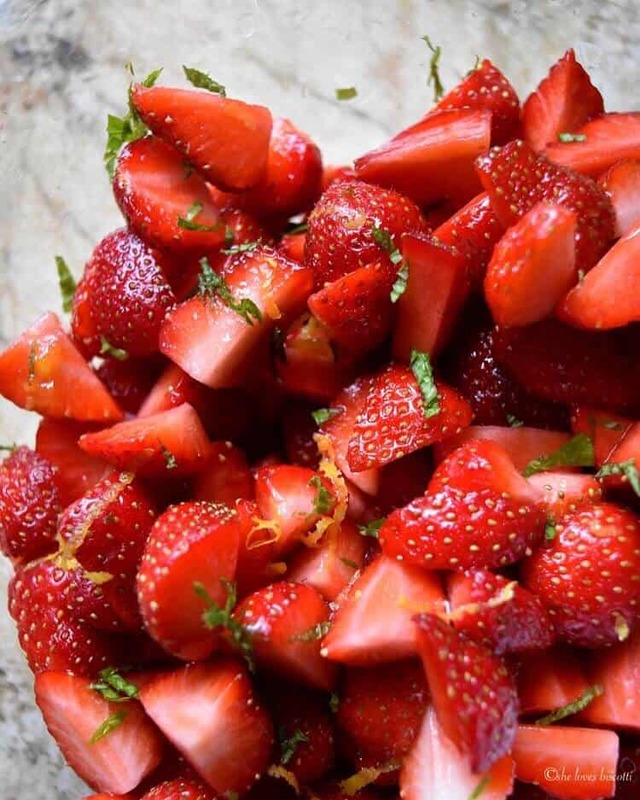 Once you have combined the sliced strawberries with the honey, lemon zest and mint, leave the strawberries at room temperature for the flavors to meld together. It’s now time to assemble and create this Easy Summer Berry Honey Whipped Ricotta Parfait! Divide the ricotta and macerated strawberries among glasses (or serving dishes). 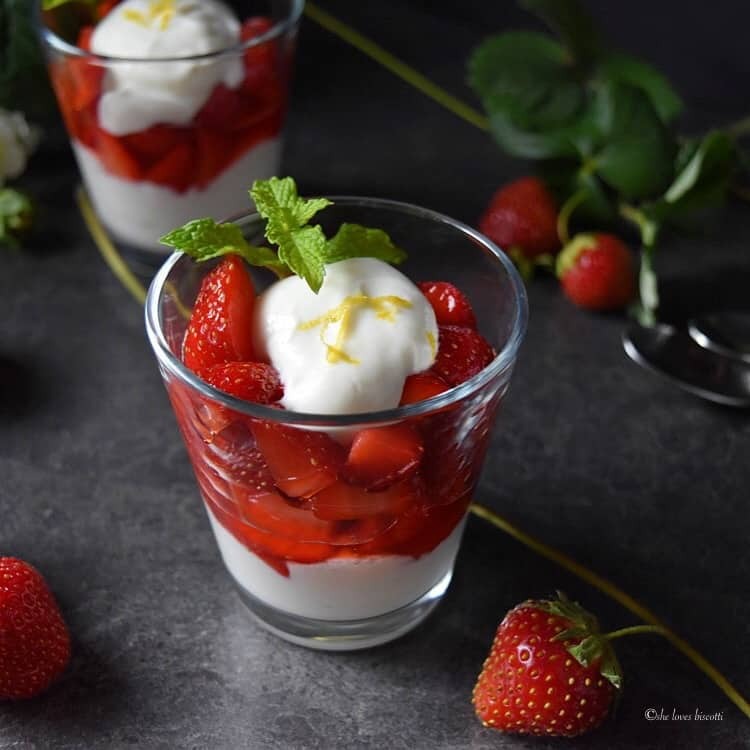 Start by placing a couple of tablespoons at the bottom of each glass, spoon a few tablespoons of strawberries on top, don’t forget the syrup that had formed from the maceration! Finally, top with another tablespoon or so of the whipped ricotta. Depending on the size of your glass, and the number of portions you need to make, you can increase the amount of layers. I will get anywhere from 4-6 portions depending on the size the glasses. If desired, garnish with fresh mint leaves and lemon zest. I just love fruity desserts, especially in the summer where fresh local fruit is easily available. 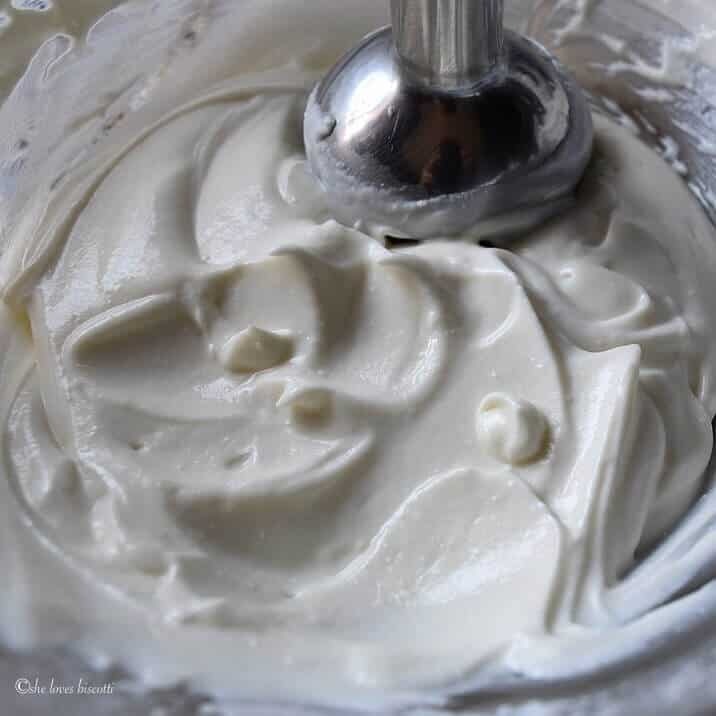 This recipe will provide you with a texture that is so creamy, that you won’t miss the extra calories and saturated fat provided by similar recipes that use cream cheese, whipped cream or even mascarpone. Whipped ricotta is equally delicious in savory appetizers. In this crostini recipe, I have combined pistacchio nuts, pomegranates, and pea shoots sprinkled on whipped ricotta which has been spread on a whole wheat baguette. This is one of my go to appetizers when pomegranates are in season. Whipped ricotta can also be used as a spread or even as a dip -be sure to check our this recipe with thyme roasted tomatoes. I have always enjoyed eating fresh fruit with ricotta. Thanks to Pinterest, I noticed that there were so many recipes that called for whipped ricotta. I was hooked from the moment I tried it. You will notice that I added a couple of tablespoons of creamy vanilla yogurt. Just in case you are wondering, I used IOGO yogurt (not sponsored). As far as the ricotta is concerned, I will often make a homemade version. But when I am pressed for time (which happens often in the summer) I like to use the TreStelle Brand (not sponsored). Summer entertaining has just become a lot easier with this wonderful dessert. It is quick to make and a delicious finish to any meal. If you have made this Whipped Ricotta Parfait recipe, I would love to hear about it in the comments below and be sure to rate the recipe! This Easy Summer Berry Honey Whipped Ricotta Parfait recipe will quickly become a household favorite. It's a no fuss, no bake, light and refreshing dessert. Combine ricotta, honey and yogurt and process until smooth and creamy (can use hand held beater, hand blender or food processor). Transfer to a bowl, cover and refrigerate for at least 1 hour. While waiting, make the recipe for simple macerated strawberries. Divide ricotta and macerated strawberries among glasses (or serving dishes). 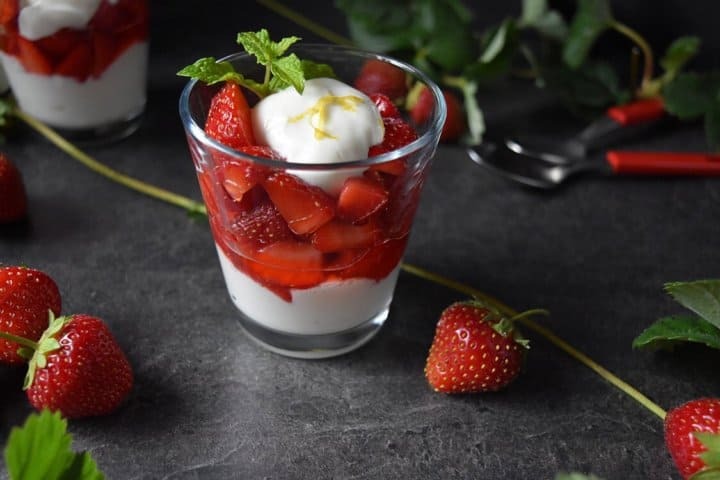 Start by placing a couple of tablespoons at the bottom of each glass, spoon a few tablespoons of strawberries on top, and finally top with another tablespoon of ricotta. If desired, garnish with mint leaves and lemon zest. DO YOU LOVE THIS WHIPPED RICOTTA PARFAIT RECIPE? Love whipped ricotta! Your dessert is perfection in a glass! 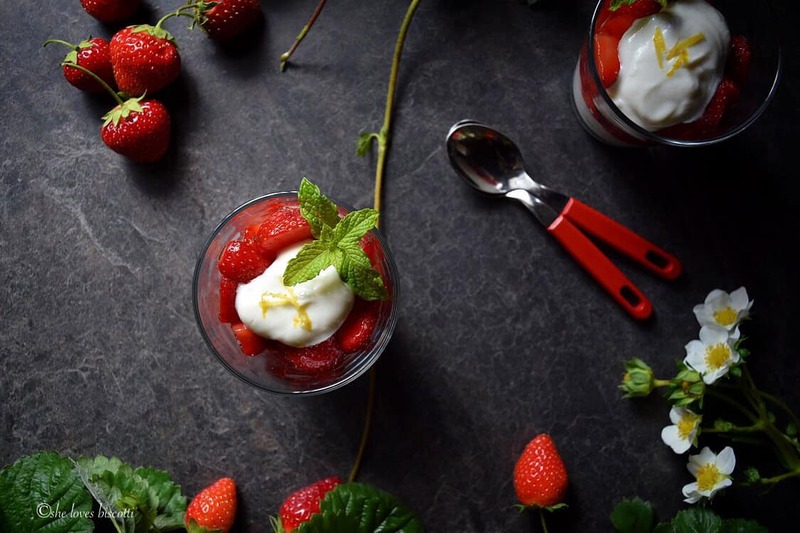 Fresh strawberries with a touch of mint–what could be better? This looks like the perfect way to end a meal. Light, fresh and flavourful! Can’t wait to try it. Good quality ricotta & honey, nothing is better. Thanks for the reminder that dessert need not be complex to be utterly sublime. So easy and very yummy! Thank you! My pleasure Inna ♥♥♥ Enjoy!